About the Songs "Sentimenal Man" and "Wonderful"
Short excerpt from the Stephen Schwartz biography, Defying Gravity. [After the San Francisco pre-Broadway production in San Francisco]....As a group, the creative team decided to replace Robert Morse (Wizard) with Joel Grey, Kirk McDonald (Boq) with Christopher Fitzgerald, and John Horton (Dr. Dillamond) with William Youmans—changes they believed would support their new plans for the script. I am a sentimental man/ Who always longed to be a father. / That's why I do the best I can/ To treat each citizen of Oz /As son or daughter. "That sounded interesting to me," reports Grey about the Wizard of Oz character. "That he never had that [experience of fatherhood] in his life and here he is in a very alien land." 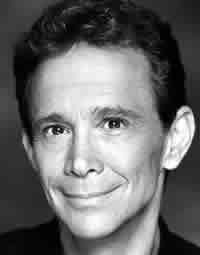 Joel Grey played the Wizard of Oz in Wicked's original Broadway cast. Hear him on Wicked's Original Cast Album. Grey is wonderful singing "Wonderful" - and dancing with Elphaba. Joel Grey received a Tony Award as the Emcee in the original production of Cabaret and an Academy Award for his work in the film. Stage: Amos Hart in the hit revival of Chicago (Drama Desk and Outer Critics Circle Awards); Give Me Your Answer, Do! (Roundabout, Drama Desk nom. ); Harry, Noon and Night (American Place); George M! (Tony nom. ); Goodtime Charley (Tony nom. ); Marco Polo Sings a Solo, The Normal Heart (NYSF); Platonov (Williamstown); The Grand Tour (Tony nom. ); Silverlake (NYCO); Cabaret (20th anniversary); When We Dead Awaken (ART); Herringbone (Hartford Stage); A Fool and Her Fortune (NYS&F).